Note : Phra Pathom Chedi is located at Nakhon Pathom, one hour west of Bangkok. 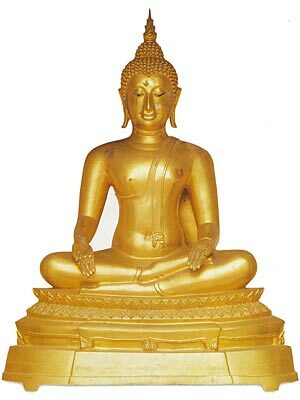 The Buddha images presented here depict various scenes in the life of the Buddha. They are mostly chronological. The Buddha images are located in the 'courtyard' around the huge Phra Pathom Chedi. When at Phra Pathom Chedi, do not omit to visit the National Museum closeby, which houses many (mostly Dvaravati) art objects depicting Nakhon Pathom's past. You can go to more pages with Buddha images (14 pages in total) using the links at the bottom of this and consequent pages. Resolving to become a monk. Siddharta leaves the palace at Kapilavastu (though the exits are heavily guarded) on his horse, accompanied by his charioteer Chandaka. 8 days after becoming a monk, the Bodhisattva receives food for the first time from a local ruler. 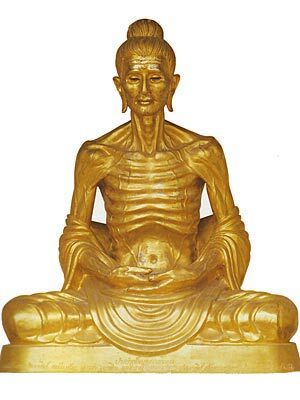 Seated in the meditation posture with thin, emaciated body. The Bodhisattva practiced extreme asceticism for six years. Extreme mortification almost resulted in his death. Eventually however, he concluded that there is a 'middle way' between extreme asceticism and worldliness. Accepting rice pudding from the milkmaid Sujata. 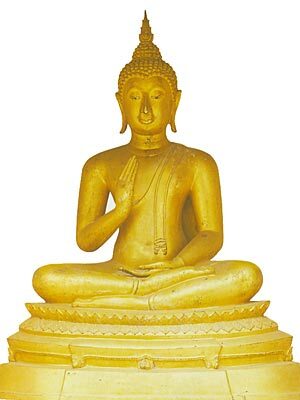 Seated in meditation posture. The Bodhisattva receives food (after realizing that mortification does not lead to enlightenment) from Suchada (Sujata), so ending his fast. 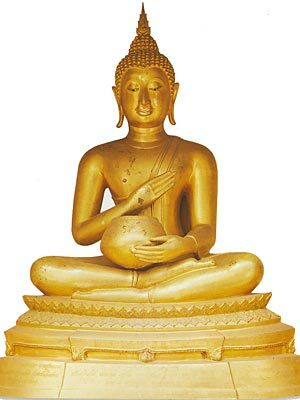 He then leaves his companion hermits at Uruvela and proceeds to Bodh Gaya.